We split up our long drive from southern Florida back home to North Carolina into 2 parts so we spent the night in Jacksonville, Florida. 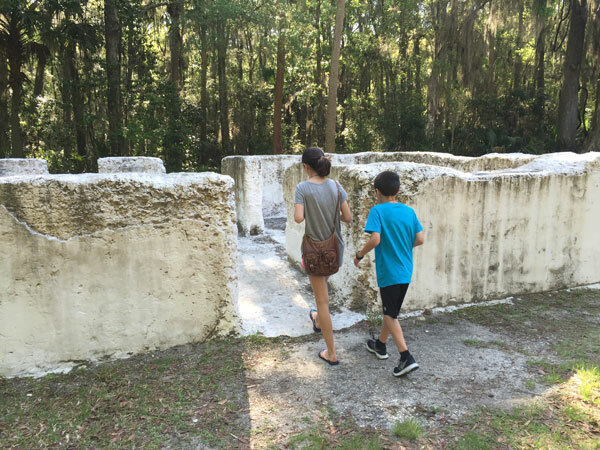 Last year we took a National Park trip on the eastern side of Florida that included Timucuan Ecological & Historic Preserve. That time we only had time to visit Fort Caroline National Memorial. 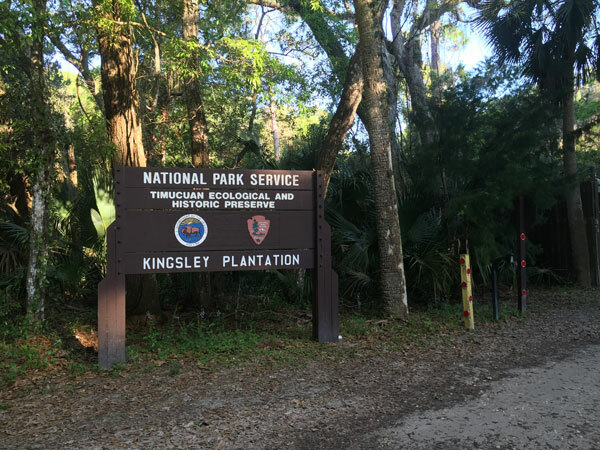 On this trip we decided to explore another site within Timucuan Ecological & Historic Preserve: Kingsley Plantation. 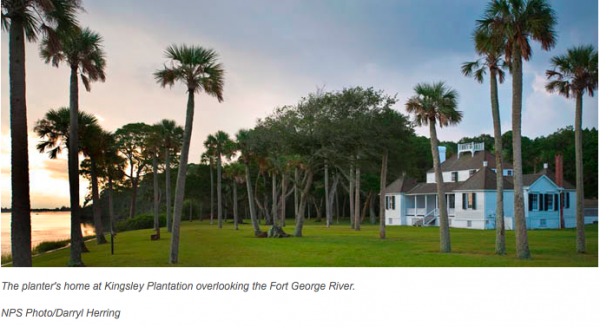 Kingsley Plantation is only a 20 minute drive from Jacksonville Airport. It features the home of plantation owner, Zephaniah Kingsley who lived there from 1814-1837. What makes this story incredibly interesting to me is his wife, Anna Madgigine Jai, was from Senegal and was purchased by Kingsley as a slave. In 1811 she was freed and then purchased slaves of her own. The drive from our hotel was short and we arrived before the park opened at 9:00. We parked in the parking lot and admired the gorgeous view of the water, the garden, and the tree cover. When we stepped out of the car we noticed something else: a lot of bugs. Fortunately we had bug spray but it was not nearly enough. 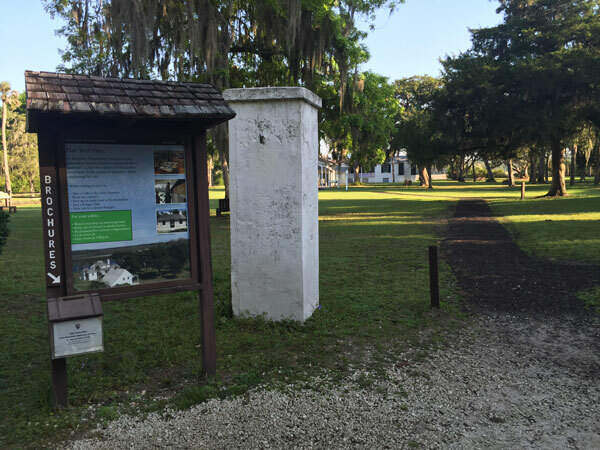 The kids immediately thought of the crazy bug issue we had when visiting Fort Frederica last year and it isn’t surprising given Kingsley Plantation is just a few miles south. 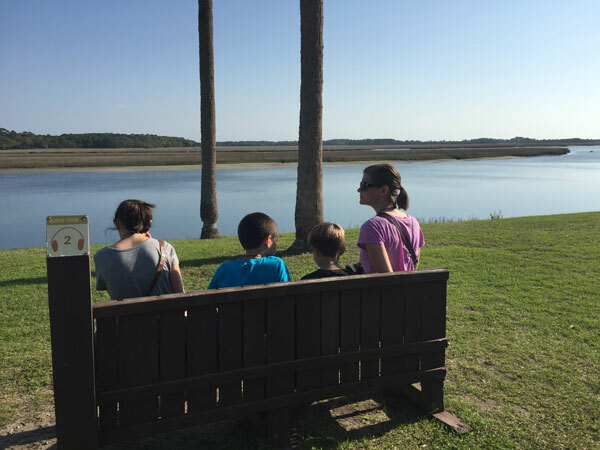 Click here to read about our family trip to Fort Frederica! When the park opened we started walking towards the house that is visible from the parking lot. After walking around for a while we realized this was part of the exhibits but not the visitor center. In fact, if not for the park ranger that we found, we would not have known where the visitor center was until walking around to the front of the building. 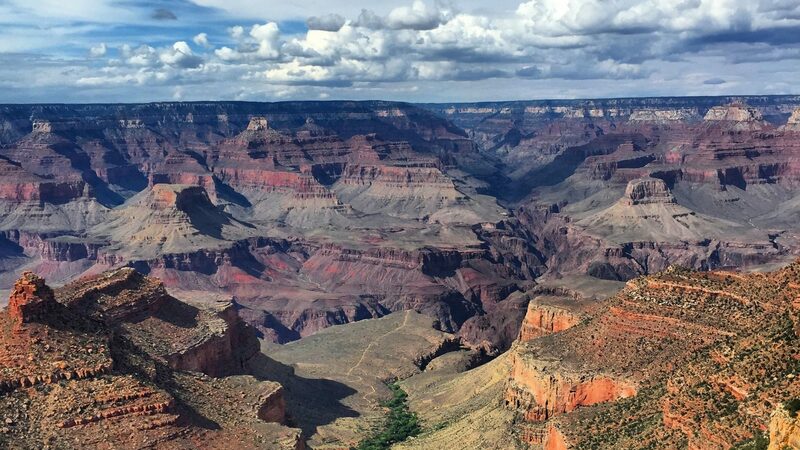 A small oversight on the National Park Service for not clearly marking the start of your visit and surely one that could cause confusion for others. What I find even more odd about the poor signage is that at the front of the building and all around the visitor center, there is fantastic signage like what is displayed int he picture above. Once we found the visitor center we were happy to get our visit started! There is a decent size bookstore there that is filled with a lot of Centennial Celebration items as well as a sizeable book selection on slaves, the Civil War, and the Kingsley family. 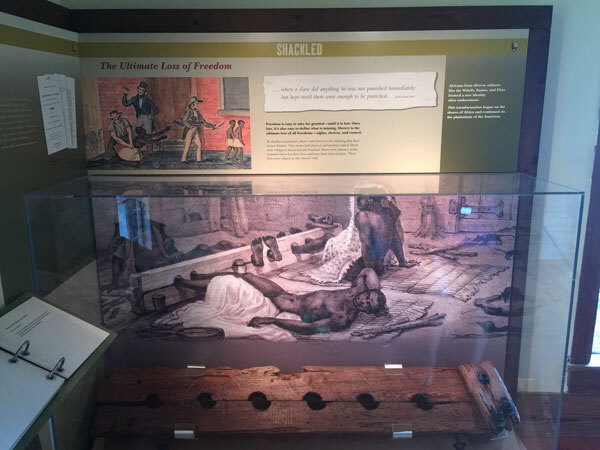 A small exhibit features information on the slaves that lived and worked on the plantation. 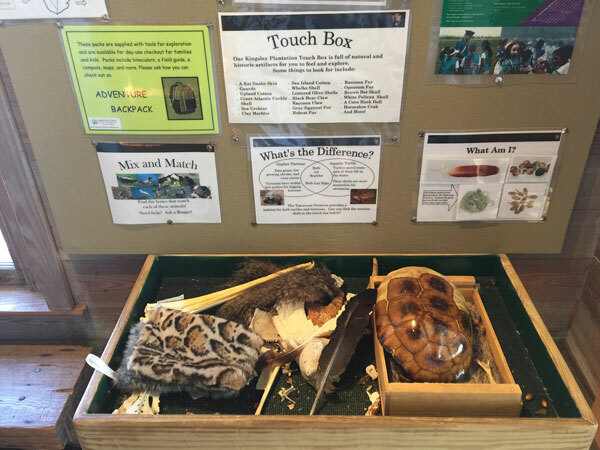 There is also a small exhibit including a “Touch Box” We saw a similar one in our visit to Biscayne National Park. Click here to read about our family trip to Biscayne National Park! 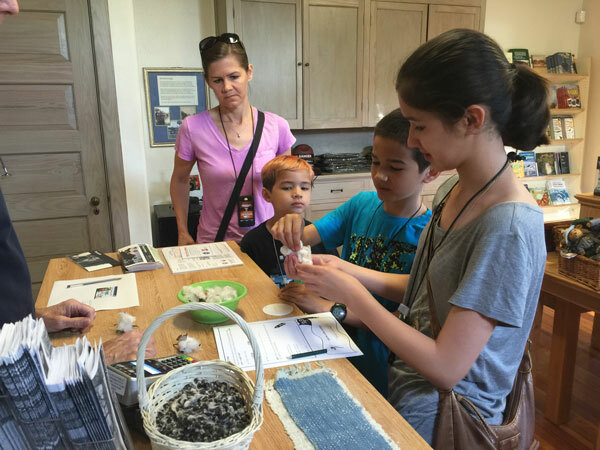 As part of my daughter’s Junior Ranger program, she participated in a “Cotton Activity” which taught her about the Sea Island Cotton that they grew on the plantation. The National Park Service has a great amount of information on this sea island cotton on their website here. We learned that slaves were forced to pick 90 pounds of cotton per day! Considering how light cotton is, that gives you an understanding of both the demands of slaves AND the yield that this plantation’s cotton fields created. 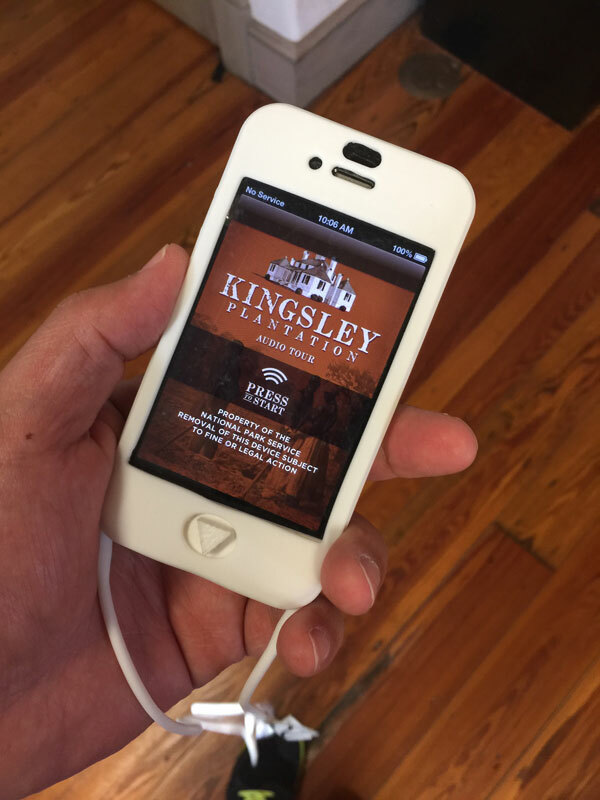 By far, the coolest thing about visiting Kingsley Plantation is the free audio tour. 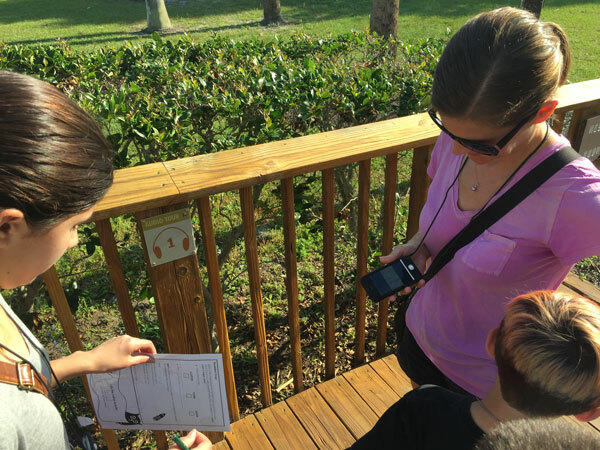 Utilizing GPS-Enabled iPod Touches, this FREE audio tour does a great job of highlighting the various points of interest around the plantation while really putting you in the time with great narration. Each stop on the tour was clearly marked and for the most part, the GPS triggered the right audio while on the tour. Some of the stops had seating so you can sit and admire the view of the water. Some of the stops within the house had artifacts from the time. 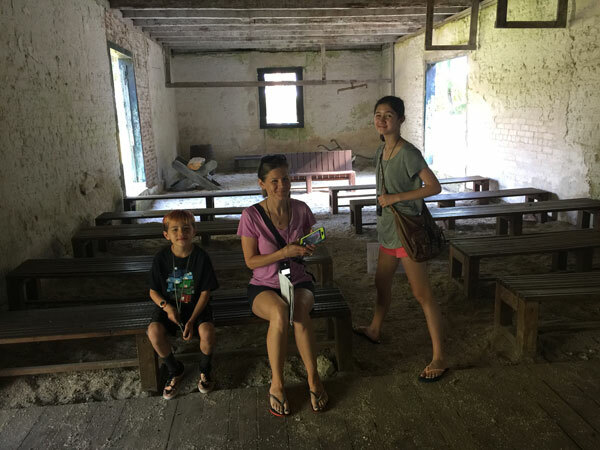 The horse stables had ample seating perfect for bigger tour groups. Another feature were the remains of the slave homes that you can walk around. 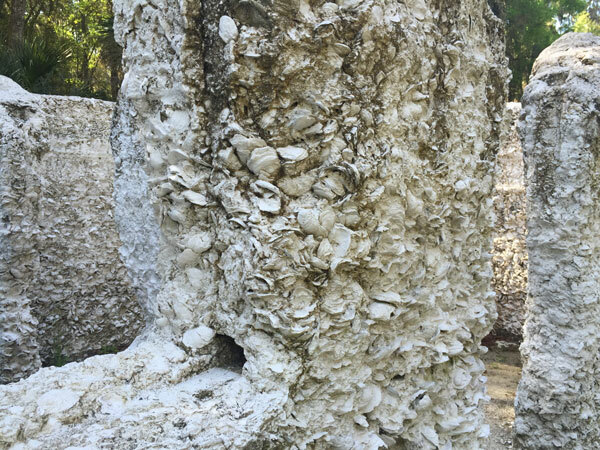 These building are built from “Tabby” which is oyster shells with lime, sand, and water. 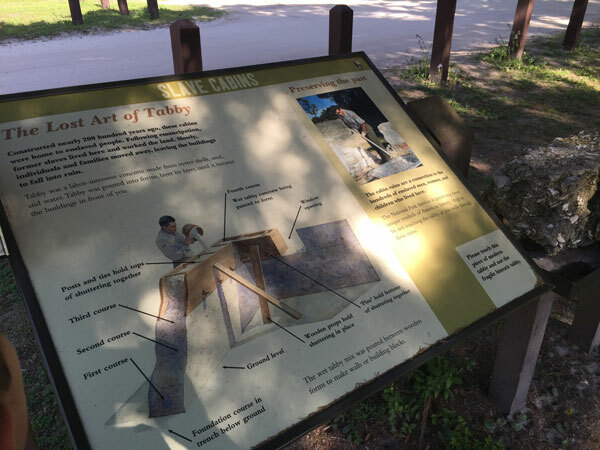 You can learn more about tabby on the National Park Service website here. Here is a closeup of the tabby. 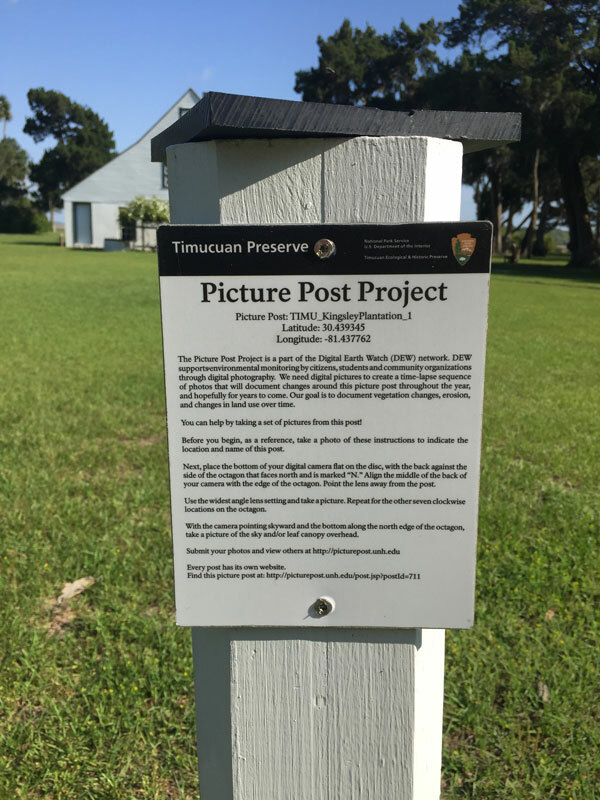 Another cool thing I saw at Kingsley Plantation is the Picture Post. Picture Post is a project that allows visitors to document the location through photographs at different times of year. 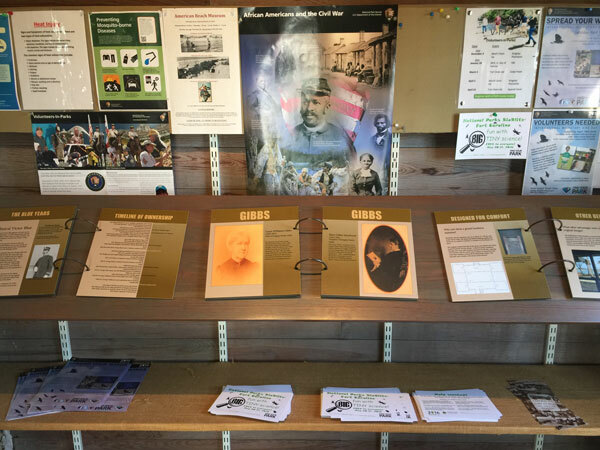 You can view pictures from the Picture Post of Kingsley Plantation here. We enjoyed our short trip to Kingsley Plantation! 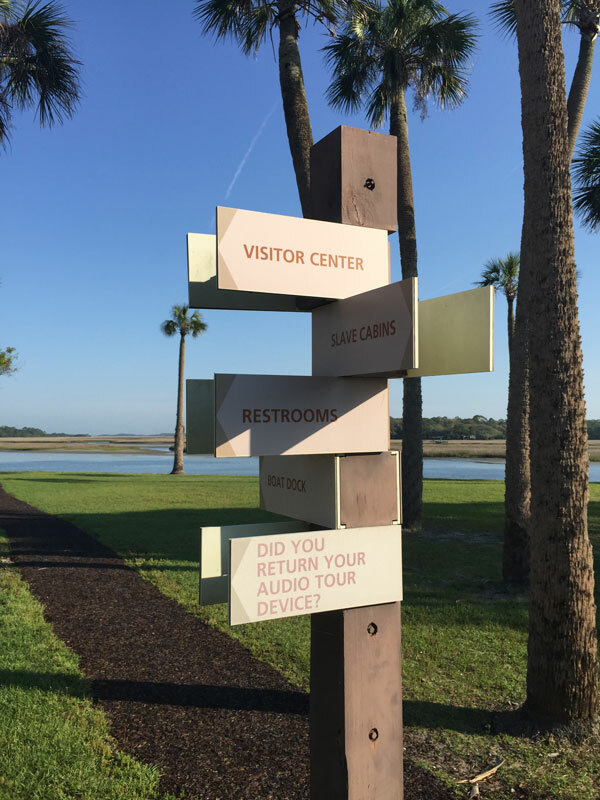 Our passport stamp at the visitor center did not add towards our goal but we loved visiting another location within Timucuan Ecological & Historic Park which was our 51st park visited last Labor Day weekend! We are maintaining a good pace towards our goal of 100 parks! The final thing I will tell you about Kingsley Plantation is the 2 peacocks we saw. Here’s a video I took driving past one of these beautiful birds!